Employment statistics are the leading indicator of what’s happening in New York State’s economy. However, traditional government job counts don’t tell us much about the underlying dynamics of job creation. Information on openings and closings, expansions and contractions, and interstate movements by employer “establishments” in New York has not been as readily available – until now. New York’s job base grew at just one-fifth the national rate. New York gained 272,172 jobs from firms moving into the state while losing 393,280 jobs from relocations of firms to other states. As a percentage of total employment, New York’s net job migration loss was the third largest of any state. Many of these positions moved to neighboring New Jersey and Connecticut. 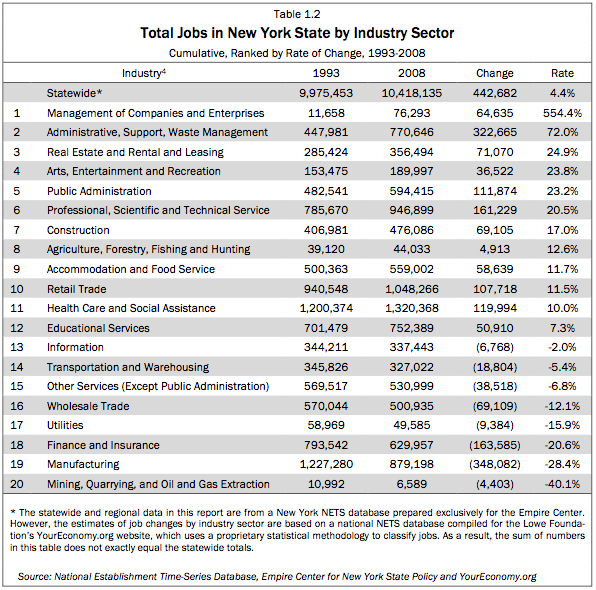 New York lost 506,620 more jobs to firm closures, or “deaths,” than it gained from firm start-ups, or “births.” The Empire State’s nega- tive ratio of job creation from start-ups was a key factor in its rela- tively weak overall employment growth during the period. Only five states performed more poorly in this category. Expansion of existing firms was the leading source of employment growth in New York, creating a net 1,000,881 more jobs than firm contractions—but this wasn’t nearly enough to make up for the state’s job migration losses and its failure to nurture more start-ups. Small establishments, including the self-employed, accounted for a growing share of New York jobs, but the Empire State nonetheless lagged behind most states in job creation by small firms. The most closely watched and widely reported economic indicators are monthly estimates of nonagricultural employment, compiled by the U.S. Bureau of Labor Statistics (BLS) and state labor departments from surveys and statistical models that are annually revised based on unemployment insurance tax filings. These “nonfarm payroll” numbers provide an indis- pensable snapshot of total employment in major industrial sectors, but offer little insight into how jobs have been created, destroyed or moved from one location to another. The official data also exclude both agricultural workers and small business owners who are not covered by unemployment insurance. To provide a broader and deeper picture of job creation dynamics, this report uses an en- tirely different set of data obtained from the National Establishment Time Series (NETS), the product of collaboration between Walls & Associates and Dun & Bradstreet (D&B). The NETS database is distilled from D&B’s proprietary national marketing information file, which includes an industrial classification code, current business name, location and number of employees for every “establishment” in the country. Using NETS, it is possible to track business births, deaths, contractions, expansions and physical movements. the distribution of jobs by firm size. 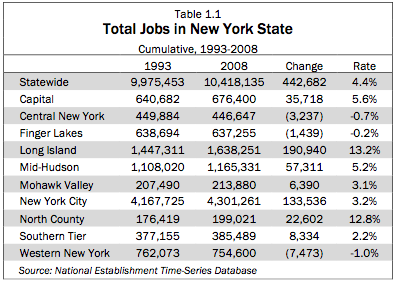 From 1993 through 2008, New York added just 442,682 jobs to a base of almost 10 million at the start of the period. The Empire State’s 4.6 percent job growth rate, as counted by the NETS database, was just one-fifth the national average during the period. 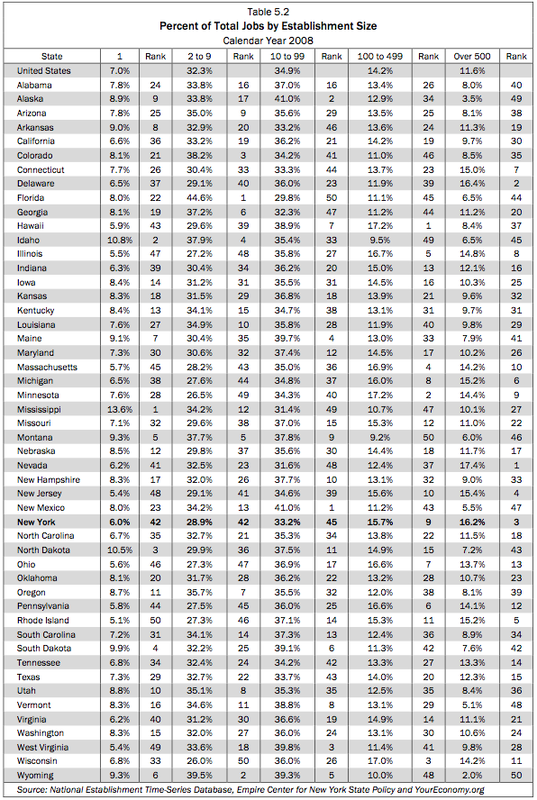 Only one state, Rhode Island, had lower growth rates by this measure. Three regions, all upstate, lost jobs during the period, as shown in the table at right. Long Island led all regions in new job creation, but was still just over half of the national level. The total employment figures are higher and the growth rates lower than those found in BLS payroll data. The nature of this difference is due to the way each dataset is created. The NETS database is constructed around business establishments, which can range from a garage-based sole proprietor to a Fortune 500 headquarters. Each establishment has to have at least one person associated with it, even if that person holds a job in multiple establish- ments. As such, NETS is a more comprehensive database. Suppose, for example, that John works a 9 to 5 job at a local store but he also owns his own landscaping business, in which he works on the weekends. BLS data would only count John’s employment at the store, while the NETS data would count both of his jobs. Overall, the NETS dataset provides a more detailed picture of economic activity, especially at the level of the self-employed and independent contractors. Studies produced with NETS data use the term “jobs” more often than “employment,” to highlight the important distinc- tion between NETS and BLS data. Establishments regularly move in and out of New York, to and from other states, taking their jobs with them. In a typical year, these movements do not account for a large change in employment. Over time, however, the annual changes can add up to a significant number. As shown in Table 2.1, from 1993 through 2008, New York gained 272,172 jobs from employers moving into the state while losing 392,280 jobs from employer relocations to other states. The only three regions to gain jobs from migrating establishments, in- cluding intra-state moves, were Long Island, the Finger Lakes and the Mid- Hudson. 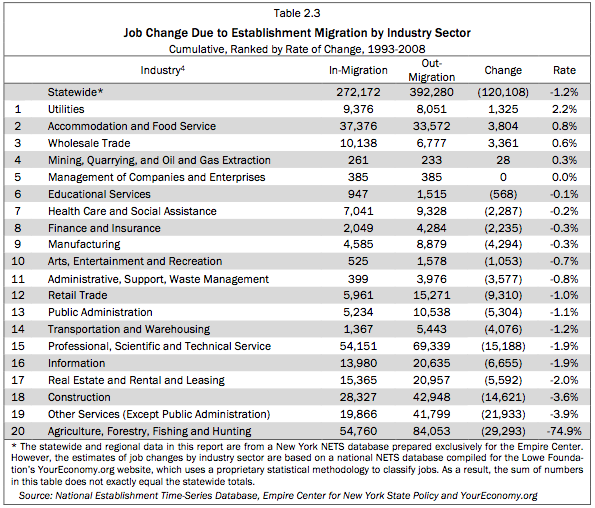 New York State’s net migra-tion loss of 120,108 jobs amounted to 1.2 percent of its 1993 job base as measured by NETS. This was the third biggest loss of any state. 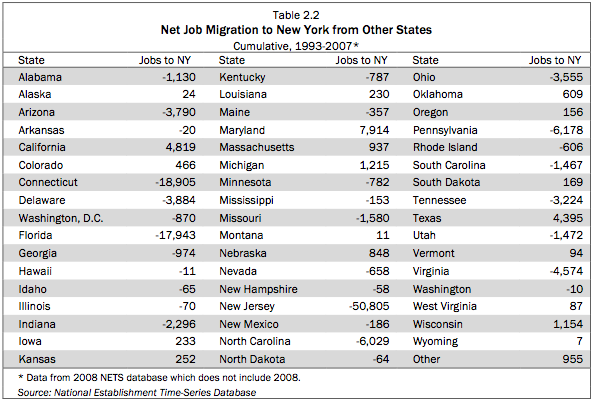 New Jersey gained the most jobs at New York’s expense, accounting for almost one-half of the total migration, as shown in Table 2.2. Connecticut attracted the second largest number of jobs due to firm moves from New York, ranking just ahead of Florida. 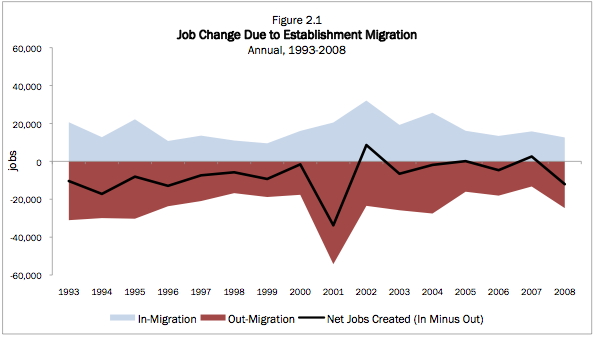 The job migration numbers roughly parallel those for total population. Since 2000, in both absolute and relative terms, New York has experienced the nation’s largest loss of residents to other states—a net domestic migration outflow of nearly 1.7 million residents. Start-ups (“births”) of new establishments and closures (or “death”) of existing firms to- gether account for a major source of the net change in total jobs. As counted by the NETS database, births include spin-offs of new establish- ments from existing firms, while deaths include cases where firms merge with others. 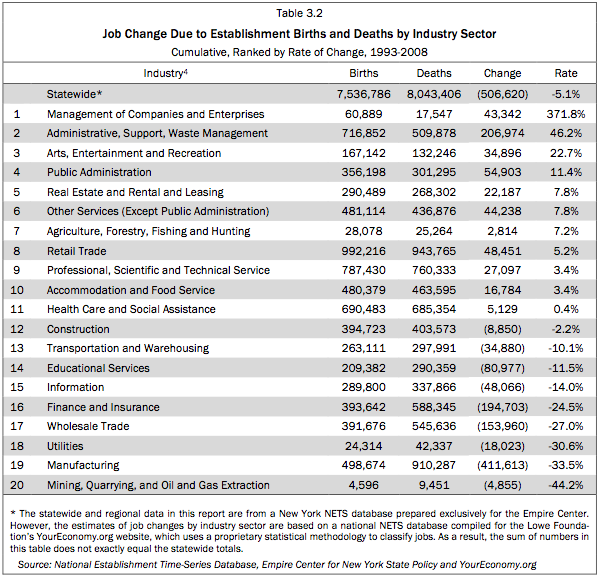 Between 1993 and 2008, New York establishments annually created an average of 471,049 jobs from establishment births while destroying 502,713 jobs from deaths. Over the entire 16-year time-period exam- ined in this study, New York experienced a net loss of 506,620 jobs. Our analysis shows that year-to-year changes in total employment are strongly linked to net job creation from births and deaths of firms. As illustrated in Figure 3.1, job losses from firm deaths occurred at a fairly steady rate, averaging 502,713 jobs destroyed. Job creation from firm births was more volatile, with an average of 471,049 created. Much of the net decrease in this category has occurred since 2002. 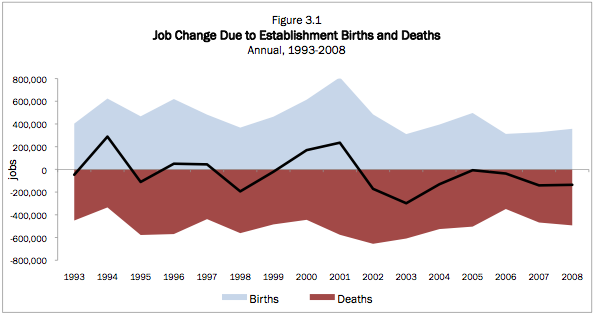 During this time, job creation from births has significantly downshifted. Average annual job creation from firm births dropped from an average of 539,233 from 1993 through 2001 to 383,385 from 2002 to 2008. The numbers indicate that jumpstarting firm start-ups is vital to increasing the total number of jobs available to New Yorkers. All but two regions of the state showed a net loss of jobs from the firm birth-death equation, measured as a share of total employment in 1993. The two gainers were Long Island (2 percent) and the North County (1 percent), while the biggest losses were in the Mohawk Valley (-10.6 percent), Western New York (-8.9 percent) and New York City (-8.5 percent). New York gained an average of 331,994 jobs a year from the expansion of existing establishments in the state—including jobs added through consolidations and mergers of firms—while destroying 269,438 jobs from contractions of firms. 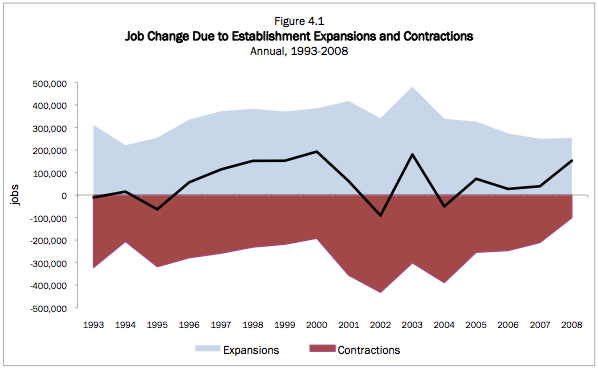 Over the entire 16-year time-period examined in this study, expansions minus contractions has yielded a net 1,000,881 jobs, or nearly 10 percent of 1993 employment as counted by NETS. While this may sound like a large gain, New York ranked only 45th in total employment growth among the 50 states during this period. All 10 regions of the state registered net growth in this category, but there were wide disparities in growth rates among regions. The New York City (12.8 percent), Mohawk Valley (12.3 percent) and Long Island (11.1 percent) regions had the highest rate of net job growth from firm expansions, while Central New York (2.6 percent), the Southern Tier (4 percent) and the Finger Lakes (6.3 percent) were notably weaker in this regard. 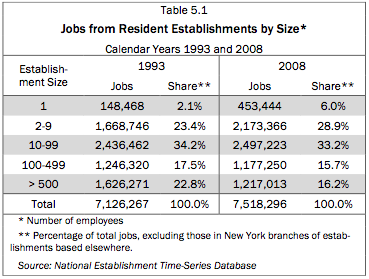 A growing share of jobs in New York shifted to smaller establishments from 1993 through 2008. As shown in Table 5.1, the number of self-employed workers increased from 2.1 percent to 6 percent of the total in New York establishments; the share of jobs found in all establishments with nine or fewer workers increased from just over one quarter to over one-third of the total in 2008. Compared to the national average, however, a smaller share of New York’s total workforce was found in smaller establishments (those with fewer than 100 employees), and a larger share worked for larger firms as of 2008. 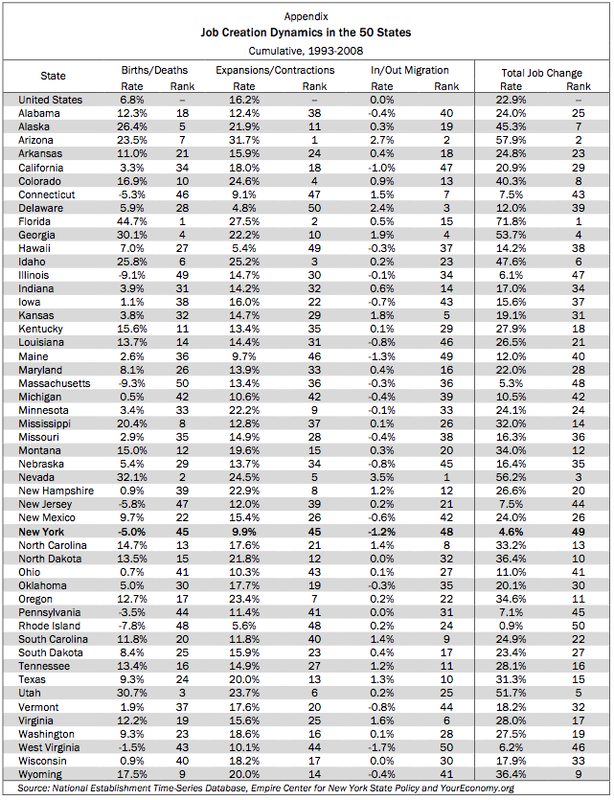 The differing distribution of jobs by firm size for New York and other states are detailed in Table 5.2. As detailed in Table 5.3, increases in self-employed workers outstripped the job growth in bigger establishments in every region of the state, but at varying rates. While only one region posted positive growth in establishment with over 500 jobs – North Country (12.3 percent) – every region posted triple-digit gains among the self-employed. But only New York City even came close to the national self-employment growth of 281 percent, and all other regions (except Long Island) had much slower rates of growth. New York’s low ranking and slower relative growth of self-employed workers relative to the nation is an especially troubling symptom of the state’s overall lack of economic competitiveness. A larger pool of self-employed may imply a higher degree of “creative destruction” within an economy and a source of seed-corn for larger businesses. As noted previously, New York’s job machine has stalled primarily due to a lack of new establishment births—including start-ups by the self-employed. These two trends are probably related and deserve more attention by policymakers. 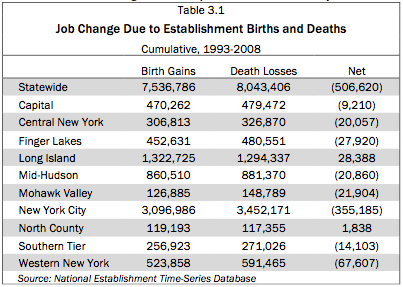 The data in this report show that a key factor in the Empire State’s poor performance was its failure to nurture more establishment “births” to offset job losses resulting from business “deaths” – which, after all, are an unavoidable feature of the free-enterprise system. A larger pool of small businesses, fed by a steady stream of start-ups serving as seed-corn for larger businesses in the future, is an important characteristic of a growing economy—an area where New York notably falls short. Ironically, New York’s relatively low percentage of jobs in small firms and sole proprietorships may have given the state some insulation from the worst effects of the recession, which has hit small business especially hard. But in assessing the state’s prospects for a strong and sustained recovery, the firm-size statistics detailed in this report are a warning sign. While the current fiscal crisis will inhibit major changes in tax policy, New York policymakers should set their sights on at least four incremental tax goals that would provide a shot in the arm to small businesses. Allow for full expensing, rather than multi-year depreciation, of business capital investments. This would allow businesses to deduct purchase costs in the years they occur. After all, a 10- or 20-year depreciation schedule is of little relevance to firms that struggle to remain alive for more than five years. Reduce state income taxes on capital gains. For many small firms, “profit” is embedded in the value of the business itself after years of investment, but the capital gains tax punishes entrepreneurial sacrifice. At least one major party gubernatorial candidate seems to recognize this need: Attorney General Andrew Cuomo, the Democratic nominee, backs elimination of capital gains taxes on investments in start-up and “early stage” firms. Republican candidate Carl Paladino has spoken of cutting the capital gains tax, without offering specifics. Eliminate New York State’s estate tax. When federal estate tax policy is settled, New York needs to ensure that its own tax in this area does not place an added burden on family-owned businesses, in particular. Do not extend the state’s higher personal income tax brackets, which were temporarily enacted in 2009 and are scheduled to expire at the end of 2011. Small business owners are disproportionately represented among those in the top brackets, and their personal income in many cases is also their working capital. 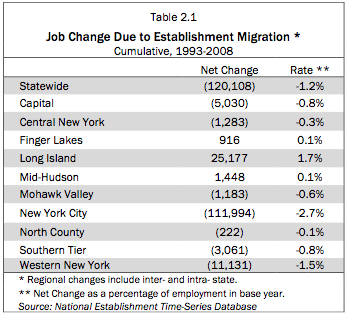 As noted in this report, another key obstacle to growth in New York has been the persistent leaky faucet of business migration to other states. This suggests that the public policy problems contributing to out-migration are deep-rooted problems, and that out-migration is not simply a reflection of the business cycle. J. Scott Moody is an economic consultant who served as a senior economist at both the Tax Foundation and the Heritage Foundation. He currently is chief economist at The Maine Heritage Policy Center, and research fellow at several other state-based, free-market think tanks. The author, co-author and editor of over 140 studies and books, his work has appeared in Forbes, CNN Money, State Tax Notes, the Hartford Courant, Portland (Me.) Press Herald and Manchester Union Leader, among other publications. He has testified before both congressional and state legislative committees. He received his bachelor’s degree in economics from Wingate University (Wingate, NC) and his master’s in economics from George Mason University (Fairfax, VA). 1. Walls & Associates converts the Dun & Bradstreet Marketing Information file into a time-series database that is useful for economic research purposes. The file is proprietary to Walls & Associates, which licenses the database to researchers across the country—including the U.S. Department of Commerce’s Census Bureau and the Bureau of Economic Analysis. 2. The NETS database is based on establishments, which means that one organization can have numerous establishments in various locations, i.e., Starbucks. Additionally, different establishments can occupy the same location. For example, an organization at a single location could represent two different activities—such as a single organization with both a distribution and retail establishment under the same roof. This provides an unprecedented level of geographic and industry classification. 3. The NETS database does not include information on the residency of workers, so jobs reported here include those held by residents of other states. More information and background on NETS, including other academic research making use of the database, can be found at http://www.youreconomy.org/nets/?region=Walls. 4. Industry sectors in this report are grouped as defined the North American Industry Classification System (NAICS), which is the standard used by Federal statistical agencies in classifying business establishments for the purpose of collecting, analyzing, and publishing statistical data related to the U.S. business economy. 5. See “Empire State Exodus: The Mass Migration of New Yorkers to Other States,” Empire Center Research Bulletin, Oct. 27, 2009, posted at https://www.empirecenter.org/pb/2009/10/empirestateexodus102709.cfm. 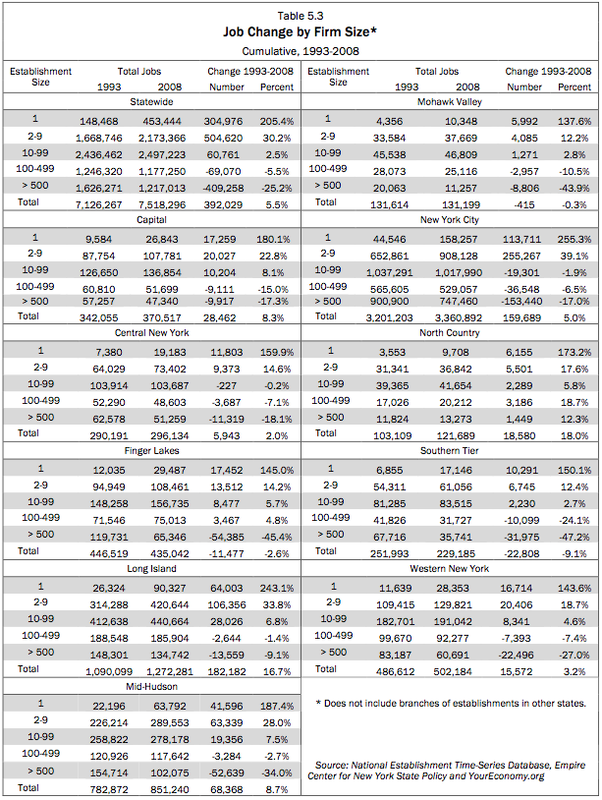 Census Bureau estimates through 2009 are posted at http://www.census.gov/popest/states/NST-comp-chg.html. 6. Closures are defined in the NETS database as the elimination of a DUNS numbers. However, a DUNS number may also be eliminated by one organization absorbing another organization. As a result, some jobs due to closures will reappear in the database as expansions of existing organizations. This bias will lead to some overestimation of jobs lost to births and deaths. 7. Solely measuring births understates entrepreneurship since the NETS database reclassifies the organization as an existing organization in the years after the birth year. Ideally, a more comprehensive metric of entrepreneurship would track these organizations throughout the organizations life-span to better understand other important issues such as the survivor rate. The unique structure of the NETS database would allow for such analysis and may be the subject of future studies. 9. In a video released by his campaign and posted at http://paladinoforthepeople.comon Oct. 4, Paladino said he wanted to cut the capital gains tax, but subsequent news reports indicated he meant this in the context of a proposal to cut corporate taxes. See http://www.newsday.com/news/region-state/paladino-switches-course-on-tax-policy-1.2336136. 10. The federal estate tax was gradually reduced between 2001 and 2009 and completely disappeared this year, but under current law is due to reappear in its pre-2002 form starting in 2011. Congress may re-enact a revised and reduced version of the tax, however. 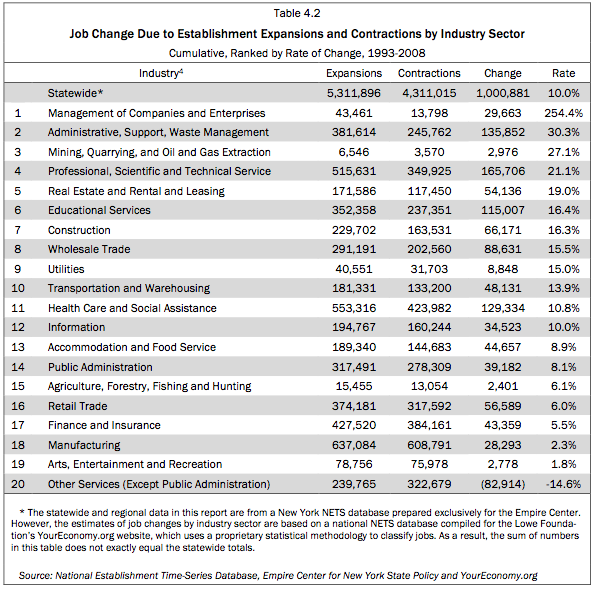 Traditional government job counts don’t tell us much about the underlying dynamics of job creation.